The big showdown has commenced - in Brazil, the first practice has finished and it is first blood to Ferrari. Felipe Massa put in the fastest lap towards the end of the session, just shading Lewis Hamilton's time from much earlier in the session. Kimi Raikkonen was right up there too, only two tenths of a second separating these three at the front. There were a few drops of rain mid-session, making the track slower than it had been but it dried out towards the end. After the top trio, there was a small gap to Robert Kubica who thereby spoiled McLaren's party, demoting Kovalainen to fifth fastest. The times were very close, however, with Alonso and Webber next up and still within a second of Massa's quick lap. 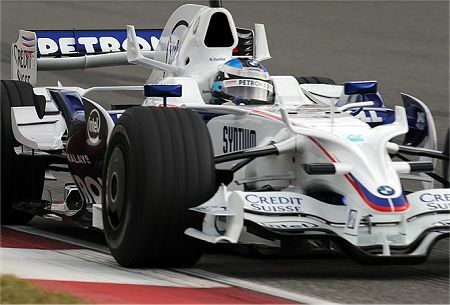 Piquet, Heidfeld and Glock made it into the top ten as well. The story continued as expected, the Williams and Toro Rossos looking good at first but then slipping down the order to midfield, the Hondas struggling to keep up as usual. Force India had a terrible morning with both cars considerably further behind than they have been of late. Interlagos is as wonderful as ever, all flat out, curving straights and sweeping bends, constant gradient changes and a few tighter corners to keep the drivers honest. The recent work on the circuit does seem to have flattened out the bumps and the fastest laps were right on the edge but as smooth as we've seen this year. Even if the threatened rain arrives on Sunday, it is looking like being a closley-fought finale to the season. So who is going to win the race? Practice 1 has been the best indicator of true performance all season (with the exception of the BMWs) and this time it points towards a three-way fight between Hamilton and the two Ferraris. There is very little to choose between them and Kovalainen continues to disappoint in not quite being able to mix it with these three. Common sense dictates that Hamilton avoid close contact with Massa and Raikkonen and, given the good starting form of the Ferraris, the most likely scenario is Felipe taking the win with Kimi and Lewis second and third. But will Lewis take the easy way out to the championship? All the evidence so far suggests that, if the chance to win is there, he will go for it - his racing instinct is clearly very strong. I have no doubt that Ron Dennis and the team will have hammered the safe option into his head time and again in the build-up to the race, but the same was true of Fuji. Memories of last year will be urging caution as well and yet we are talking of split-second decisions made in the heat of the moment. My guess is that this time Hamilton will prove the equal of the pressure; he will take third if that is all that is safely on offer. I really cannot see him risking everything on an unnecessary overtaking move this time out and it will be one of those podiums where the winner of the championship takes the title from lower than the top step. Massa will take the GP win, since Ferrari have to cover the possibility of Lewis breaking down on the last lap, and Kimi will be right behind him at the line. Hamilton was 9th in the second session and threw his gloves when he returned to the garage. The pressure compensation resources are looking a bit stretched, and if it's dry in the race I think Hamilton will need to give it everything he has to get even 5th (Kovalainen was 15th). Luckily for him, rain has been forecast for Sunday and drizzle for Saturday. So he may simply be able to show his wet-weather skills, in which case he could well win whether he needs it or not. I wouldn't set too much store by the second practice session, Alianora - the times were strange, as they often are in P2. Even if McLaren are having set up problems (unlikely, since Hamilton set a quicker time in the morning), there is still P3 for them to get things sorted out. If we believe the P2 times were representative of qualifying and race pace, that would mean drivers like Trulli, Webber and Vettel are in with a serious chance of grid positions in the first couple of rows. No, I think the teams were trying different fuel level strategies and it is more likely that Hamilton was annoyed with himself for a mistake on a hot lap than anything to do with the car. Actually, they were even stranger than they looked, for there was drizzle in the middle of the session and not everyone ran in the dry. But it is pretty clear to me that McLaren have trouble in at least some conditions, if not others.